As always, Mr. Robot gathered all sorts of gear data for the patch and asked me to share it. The list below starts with the highest iLevels and works its way down. You can browse all 6.2 gear on our site now (trinkets and set bonuses have placeholder estimates. Stat weights are not yet updated). Bosses in Hellfire Citadel drop higher and higher iLevel gear. 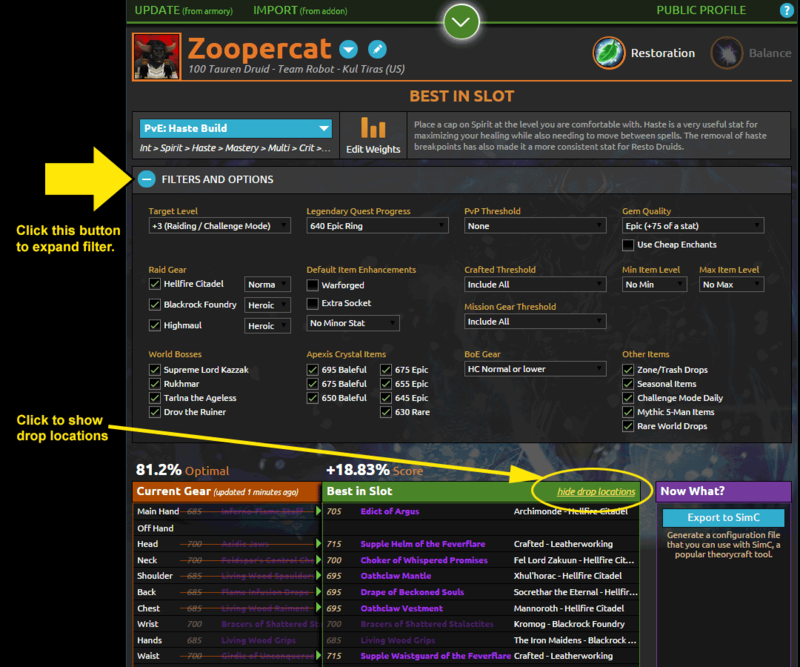 Load your character and play with gear on the character page, Best in Slot, and Optimized views. Note that set bonus and trinket estimates have placeholder values right now. Stat weights are also not updated (but you can get your favorite weights shared from a theorycrafter if you’d like). Click the ‘edit weights’ button to the right of your character name to get the controls shown below. Get those rings! It’s a… group on-use, I suppose you could call it. When one person uses it, it procs for everyone in the raid, increasing damage and healing by 25% for 15 seconds (2 min cooldown). I’ve listed the iLevel each boss drops (and set items are in parenthesis). For comparison, BRF iLevels are 670N / 685H / 700M. Remember, you likely have a lot of high level items from your garrison raiding missions. 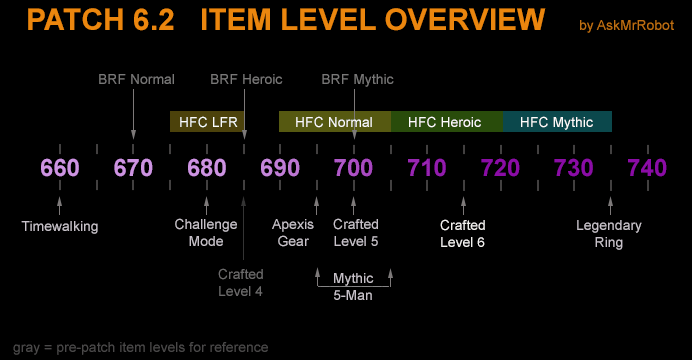 So if you are a Heroic BRF raider, you likely have a lot of level 700 BRF mythic items. That means early heroic bosses in HFC give you a 5 iLevel boost over mythic garrison gear, and 20 iLevels over Heroic BRF boss drops. Each classes gets a specific trinket that has a chance to drop off Archimond. Below are the 705 Normal mode versions (use the drop down right under the item to switch between N/H/M on wowdb). The Heroic and Mythic versions increase proc chance % as well as other percentages listed. These drop as a token off Archimond, grouped by the same classes as tier tokens. Once you win it, you can turn it into your class-specific trinket. Rank 5 “Mighty” crafted items increase to iLevel 700 and rank 6 “Savage” increases to 715. Weapon upgrades are 10 iLevels lower. Upgrades require Felblight, which can be obtained in Tanaan Jungle from gathering professions (fishing, herbalism, mining, or skinning). Also, all previous rank upgrade reagents (2-4) have been consolidated into 1 reagent, making early upgrades easier and cheaper. A mythic difficulty will be added to Draenor dungeons, rewarding iLevel 685 items, with end bosses having a chance to drop iLevel 705 warforged items. There is also a Timewalking “Bonus Event” that rewards a cache containing a “Heroic Hellfire Citadel quality item.” My best guess is that means you can get any item from HFC, ranging from 705-720 iLevel. New apexis gear will have a base iLevel of 650 that can be upgraded to 695 with an Emowered Apexis Fragment. You get a free 650 item and a free fragment after completing the quest, The Cipher of Damnation, part of your garrison campaign. More 650 items can be obtained from garrison missions, Tanaan mob drops, and Tanaan quests. More upgrade fragments can be purchased for 20,000 Apexis Crystals (it’s BoP so you won’t find it on the AH). Challenge mode strong boxes will now reward iLevel 680 (up from 650). You can go back and fight through selected old content, with a catch. Your gear is scaled DOWN to an appropriate level. The bosses drop gear that scales back UP to an appropriate iLevel for a level 100 player: iLevel 640 (660 Warforged). With patch 6.2.2 (Sept 1), new gear was introduced at iLevel 675. There is a Timewalking “Bonus Event.” If you complete 5 timewalking dungeons, you get an extra bonus roll that does NOT count toward your weekly cap. That’s up from +50 for the blue (rare) gems. Each epic gem will require 15 Felblight (which can be obtained through gathering professions in Tanaan Jungle). Here’s a guide on Icy-Veins. As you win gear, give “Best in Bags” a shot. Mr. Robot will dig through all of the gear you own and tell you what the best items are to equip. No more wondering if that lower iLevel item with a socket is better than the higher iLevel. Mr. Robot KNOWS! As you kill bosses in Hellfire Citadel, try out our new Live Loot Ranking tool. It ranks gear that drops for every player in the raid. Get the addon here. You can sort of cheat to accomplish this right now… if you put a soft cap on spirit, and then set an after-cap weight, all temporary spirit procs will be weighted at the after-cap value. So even if you don’t want a cap… you could just set the spirit cap really high (unreachable), but it will still value temporary spirit lower. The Shaman trinket shows the Rogue tooltip. Can you link me to your character with the item as an example? We’ll check it out. Your image implies Mythic 5 mans are 695 and 705, they are 685 and 705 right? ooops. my mistake on a recent edit. I will fix. Thank you!